Celtic have confirmed winger Jonny Hayes suffered a broken leg in a tackle with Josh Meekings against Dundee. Republic of Ireland international Hayes, 30, and Dundee defender Meekings, 25, both went off after coming together in a challenge. Meekings was able to hobble off but was on crutches after the game. Celtic manager Brendan Rodgers was hopeful after the game that Hayes had only suffered bruising to this shin, but tests confirmed a broken leg. 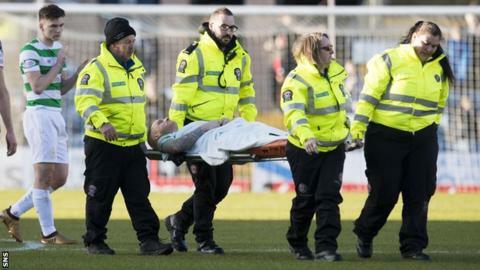 "Celtic Football Club has to report that, regrettably, Jonny Hayes suffered a broken leg during the game against Dundee at Dens Park," the club said in a statement. "Jonny had surgery today and will now be out for some time as he begins the long road back to full fitness. He will make a full recovery but he's unlikely to feature again this season. "He will receive the best care and attention throughout the months ahead, while the thoughts and best wishes of everyone at Celtic and, indeed, the whole Celtic family, are with Jonny. " Dundee boss Neil McCann reported that Meekings "is on a set of crutches, so that is never a good sign, but hopefully it is only precautionary". "Josh took a really sore one on the top of his foot," McCann explained. "I am hoping Jonny is OK as well. It was just one of those challenges - full steam ahead from both players. "I felt the game should have been stopped immediately, with the noise of it, and Jonny's reaction suggested it was a bad one. But, as long as both players are OK, I won't gripe about that." McCann admitted there were few positives his side could take from the game. "It was disappointing in terms of what we have been doing with the players," he explained. "We were a bit too tentative and too often took the easy option - going sideways when we needed a bit more cutting edge. "We started to trust our game a bit after the first goal but then we gave away a really sloppy second goal. "There was no great belief that we could get back into it in the second half." Rodgers, meanwhile, reflected on an "excellent performance" that featured goals by James Forrest and Leigh Griffiths. "It was about the hunger to win the game and I think that was pretty clear how we started the game," he said. "We scored a very good goal. Great move. Great passing. Our possession was really good and we opened them up in numbers and finished off really well. "And the second one was a great demonstration of that hunger." It was the first time since September that Celtic had won three games in a row, and they will aim to extend that in their last match before a three-week winter break - an Old Firm clash with Rangers on Saturday, 30 December. "I think we're looking pretty good," Rodgers added. "I think we're looking fit and strong and focused, especially at this time of year. "It was an important three points for us today. We'll recover now and get ready for what will be another really good game at the weekend."